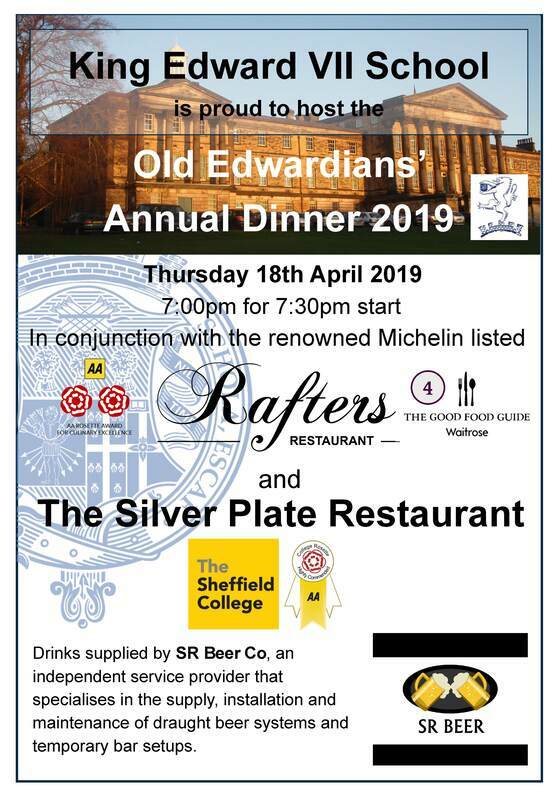 This year, as of course is customary, the annual Old Edwardians’ Association Dinner was held on Maundy Thursday at Baldwin’s on Psalter Lane, Sheffield. This year’s attendance figure was slightly down on last year's total but it was wonderful to see so many people attending the dinner for the first time replacing the old guard and encouraging to see that they in the main comprised Old Edwardians from the post Sharrock era. This was sadly the final Association dinner to be held at the the traditional venue of Baldwins as the venue is to close later this year. A huge loss to the city and we wish David and his family and staff well in all their new ventures. This was undoubtedly the most enjoyable and successful Association dinner in many, many years and those, that for whatever reason, were unable to attend missed an absolute treat. The School, this year, were represented by members of the teaching staff, both past and present, and the Head, Linda Gooden addressed the diners with an excellent and beautifully delivered frank account of the School's future and how its close links with the Association are so important to its continuing success. The guest of honour and main speaker was Nabil Nayal. Nabil attended the School between 1999 and 2003 having come to England from Aleppo in his native Syria. After studying at the Royal College of Art, Nabil has become a highly successful fashion designer and in 2010 pioneered the use of 3D scanning and printing techniques. Also in 2010 his entire design collection was exclusively purchased by Harrods and was invited to the British Clothing reception at Buckingham Palace where he was introduced to Her Majesty the Queen. Many of his designs are worn by celebrities including Rihanna, Lady Gaga, Claudia Schiffer and Victoria Beckham. Nabil was an inspirational speaker who held the audience enchanted as he recounted details of his life and successes in his chosen field. My personal thanks and those of the Association go to both Nabil and the Head for their attendance and wonderful contribution to the evening. The raffle, like the speeches, was a much shorter affair this year with exceptional prizes being donated by both Sheffield United and Sheffield Wednesday and a huge thanks should go to Philip Bramwell and Kevin Clarke who undertook to raise funds for two remarkable prizes. A heartfelt thank you must also be extended to the Association committee who worked hard behind the scenes to make sure the dinner was a success and of course to Nicol Garnon, who yet again, spent most of the evening sneaking up on people and photographing them. The 2019 dinner is already scheduled for Maundy Thursday but the venue is currently very much a work in progress. See you all next year wherever that might be. ​As is customary, the annual Old Edwardians’ Association Dinner was held on Maundy Thursday at the traditional venue of Baldwin’s on Psalter Lane, Sheffield. This year’s attendance figure was in excess of 130 who were entertained to an excellent meal on what was the penultimate dinner to be held at this venue as David Baldwin is retiring and so the Association dinner of 2018 will be the final celebration held at the Psalter Lane premises. An alternative venue is currently being sought. Sadly however, for the very first time in living memory, the School were not represented at the occasion, a matter that will be surely be rectified for 2018. The guest of honour and main speaker was His Honour, retired Judge Robert Moore. Robert has been a huge supporter of the Association over many years and it was a pleasure to hear him speak so eloquently particularly making reference to the ubiquitous nature of Old Edwardians in all walks of life. Our thanks go out to Robert for his speech and continued support. As always the food was excellent, service exemplary and the company even better. The raffle and subsequent auction conducted by the ubiquitous Chris Mower, raised much needed funds for the Association which in turn are used to support the continuing endeavours of the School and its students. The 2018 dinner is already scheduled for Maundy Thursday at Baldwin's. Please try to attend and encourage friends, colleagues and contemporaries to come along too. We would like to break the 150 barrier or perhaps slightly ambitiously the 200 mark. Baldwins assure me that they do have lots of chairs. The Association are saddened by the news that Arthur George Jones (AGJ) who taught Classics at the School from 1960 to 1989 passed away in Frimley Park Hospital on 29th March 2017. Our thoughts are with his friends and family at this sad time. Many I am sure will have fond memories of Mr Jones. In the light of Government proposals regarding the future of secondary education in this country please see the text of a letter from the Head of King Edward VII School regarding academisation proposals. Against a constantly changing, and exciting at times, educational landscape, we write to inform you that although the media reported a u-turn on the academisation of all schools by 2022, in reality, the Government’s position has not changed. The information from the Department for Education and the Regional Schools Commissioner is unequivocal - all schools must convert to academy status. In Sheffield there are only a small number of Local Authority secondary schools remaining and all the rest have converted to academy status as part of multi-academy trusts. Anticipating this position, the Governing Body and Leadership Team of the School have been pro-active in researching different models and partnerships since the announcement was made by Justine Greening, Secretary of State for Education. It is essential for King Edward VII School, with its long and distinguished history and ethos, to retain control of its own destiny and to consider carefully the options that will enable the School to build strong, collaborative partnerships that will work in the best interests of our students, families and communities. The School must be ‘future-focused’ to ensure that we can safeguard the future of students and the School. ​Taking this into account, we have explored a number of options including creating a multi-academy trust with other local schools and schools further afield. Discussions are still ongoing and as part of this process we are determined that the final decision that is made will take account of the views of parents, carers and other stakeholders. It is of the utmost importance that we make the right decision for King Edward VII School. We will provide you with further information as soon as it is available during this period of momentous change for our School. The Old Edwardians' Association are deeply sad to announce the recent death of Eric Allsop. ​Eric was a good friend to the Association and a close supporter of the School. His funeral will be held on MONDAY, 3rd APRIL at NETHER GREEN METHODIST CHURCH at 11.15am. 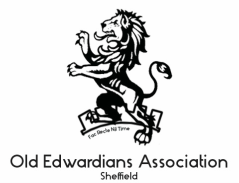 The Old Edwardians' Association is saddened by the sudden passing of Mark Reid. In addition to being a tremendous rugby player playing for England at junior lever whilst still at school, he was an avid supporter of the school and the Association, Reidy was a gentleman and a great friend to all. His funeral will be held at East Berkshire Crematorium at 12.45 on Wednesday 22 March 2017 with a thanksgiving service to follow at 2pm at Maidenhead Rugby Club.